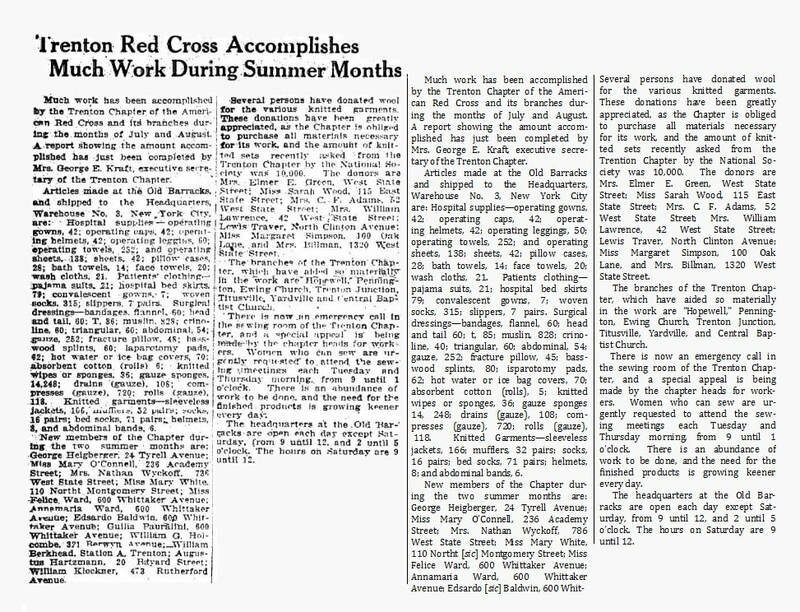 Throughout 1917, the women of the Trenton chapter of the Red Cross worked at the Old Barracks, eventually taking over the entire building by 1918. Volunteers cut and sewed operating garments, knitted socks and sweaters, and made wound dressings and bandages. 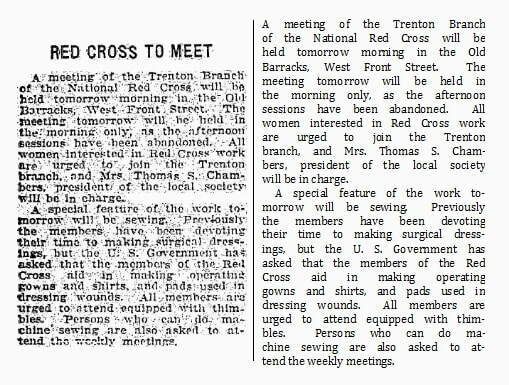 The Trenton Evening Times, a popular city newspaper, often published details about Red Cross meetings and events. 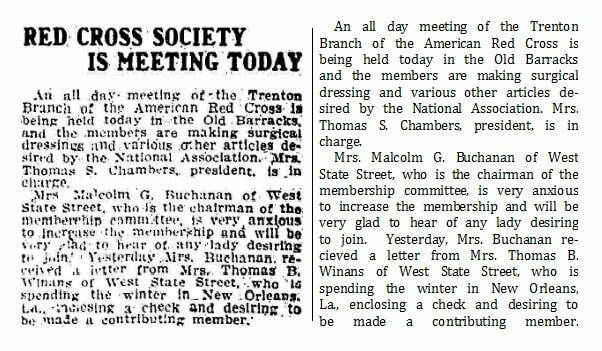 Trenton Evening Times, February 27, 1917. Trenton Evening Times, March 15, 1917. Trenton Evening Times, March 19, 1917. Trenton Evening Times, September 11, 1917. Trenton Evening Times, October 29, 1917. 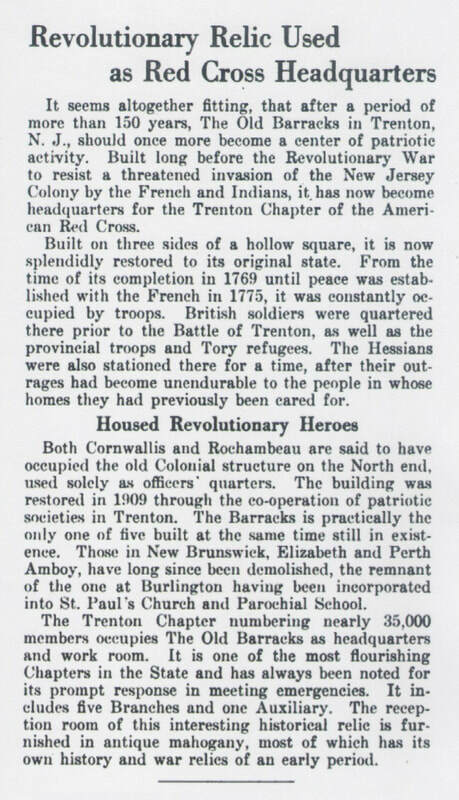 The unique and patriotic accommodations of the Trenton chapter during the war garnered notice from the National Red Cross organization. In January 1918, the organization’s internal publication The News Letter published this piece discussing the use of the Barracks as a Red Cross site. The News Letter, American Red Cross, Atlantic Division, April 24, 1918. Archives of Old Barracks Association. Excitingly, a record of exactly how the building was used by the Red Cross exists. In 1926, the American Red Cross held their Regional Conference at the Old Barracks. 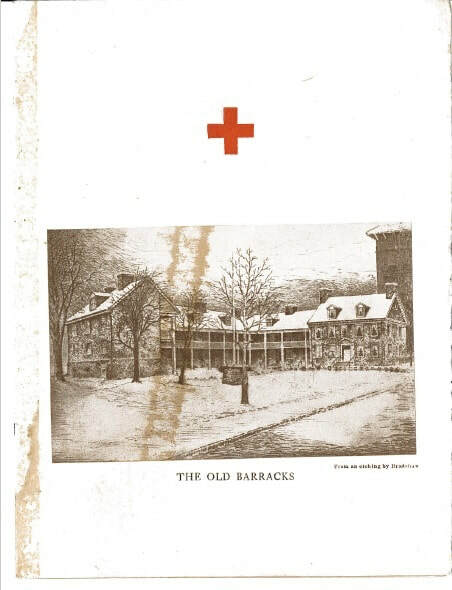 The pamphlet made for the conference included a detailed description of how the Trenton Red Cross used each room of the Barracks. Cover of the booklet for the Regional Conference of American Red Cross Chapters held at the Old Barracks in October 1926. Archives of Old Barracks Association. Specifications of Red Cross' usage of the Old Barracks during World War I, from the booklet for the Regional Conference of American Red Cross Chapters held at the Old Barracks in October 1926. Archives of Old Barracks Association. 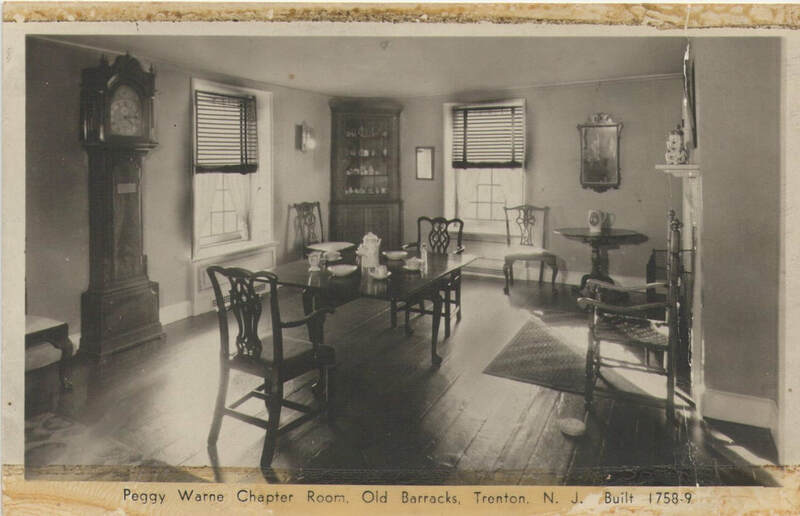 In the photos below, the information from the pamphlet has been matched to photographs of the corresponding rooms in the Barracks as they were decorated when used by the patriotic organizations. 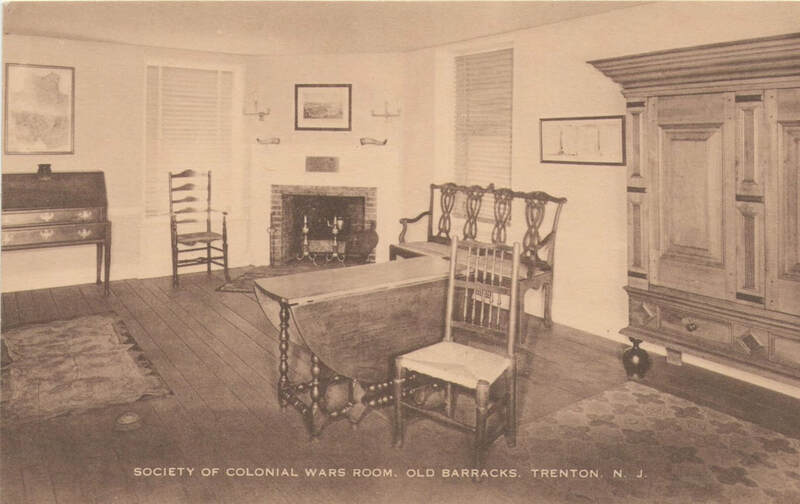 During the war, the Society of Colonial Wars Room was used as an executive meeting room by the Red Cross Council. From the Collection of the Old Barracks Association, 1989.003.0009. 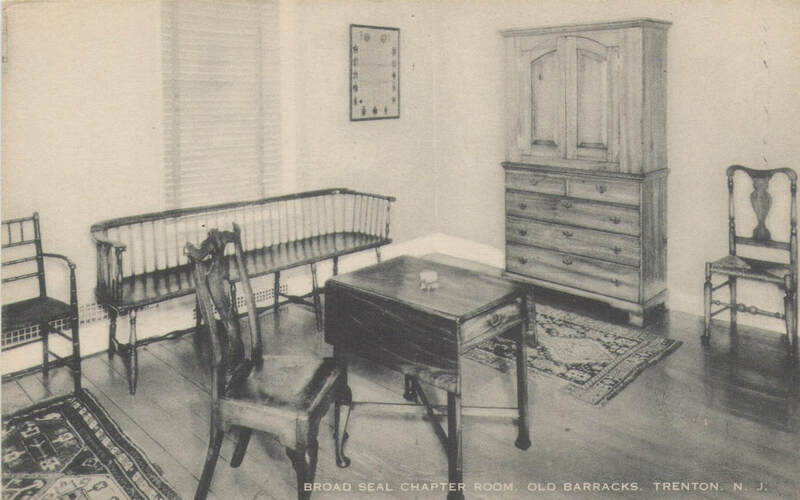 The Broad Seal Room, which belonged to the D.A.R., was used to hold classes. From the Collection of the Old Barracks Association, 1984.001.0002. 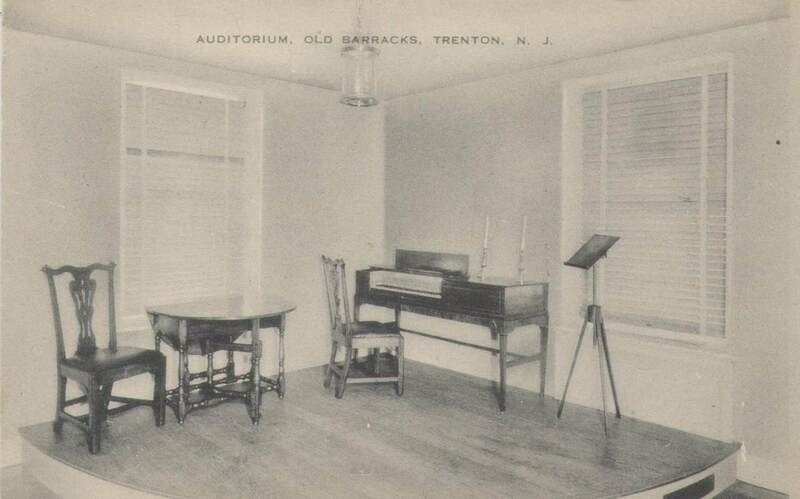 The Auditorium was used exclusively for sewing, with “a sewing machine…located at every window.” From the Collection of the Old Barracks Association, 1984.001.0001. The Peggy Warne Chapter D.A.R. room was used for storage purposes during the war. From the Collection of the Old Barracks Association, 1989.004.0006. 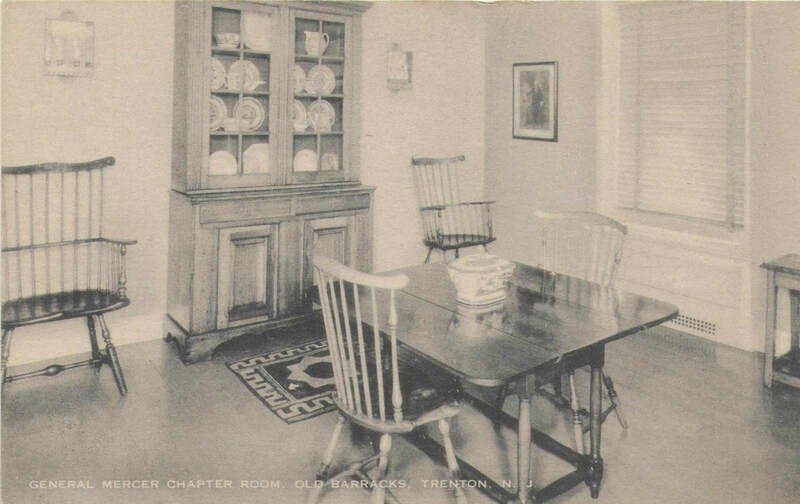 The General Mercer Chapter Room, which belonged to the D.A.R., was used for storage and occasional executive meetings of the Trenton Red Cross. From the Collection of the Old Barracks Association, 1984.001.0012. 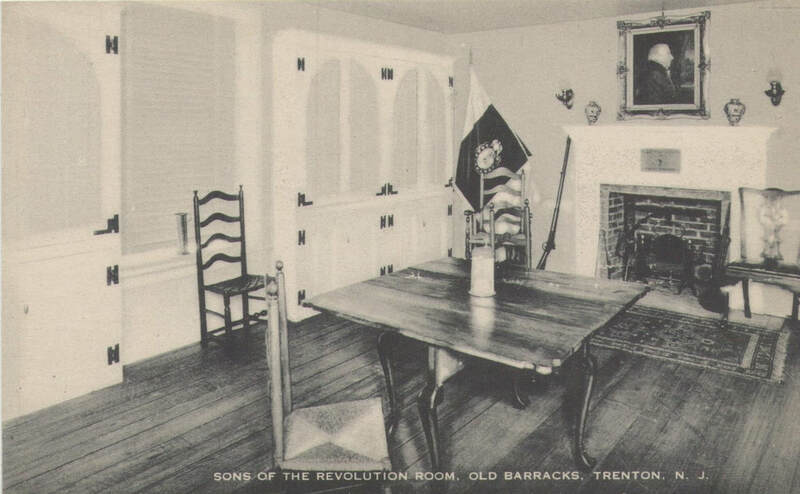 During WWI, The Sons of the Revolution State Society Room was used for sewing, as well as packing Red Cross kits. From the Collection of the Old Barracks Association, 1984.001.0003. The Trenton Red Cross’ tenure at the Old Barracks proved a successful undertaking, thanks to their many volunteers and supporters—the Old Barracks Association and its members chief among them.